‪#‎Sanaa‬: Saudi coalition jets pounded the capital Sanaa for hours since the early hours of yesterday evening and the raids lasted for hours until the early hours of this morning. It is said that 30 missiles hit several districts within the capital, including the historic 2500 year Old City of Sanaa. A missile hit al-Falaihi quarter of the old city leveling one house and partially destroying three others. Several civilian casualties were reported with the death of an entire family in the Old City. ‪Sanaa‬: Saudi coalition jets pounded the capital Sanaa for hours since the early hours of yesterday evening and the raids lasted for hours until the early hours of this morning. It is said that 30 missiles hit several districts within the capital, including the historic 2500 year Old City of Sanaa. A missile hit al-Falaihi quarter of the old city leveling one house and partially destroying three others. Several civilian casualties were reported with the death of an entire family in the Old City. Graphic Photos: Initial photos of the victims of The strikes on Sanaa. 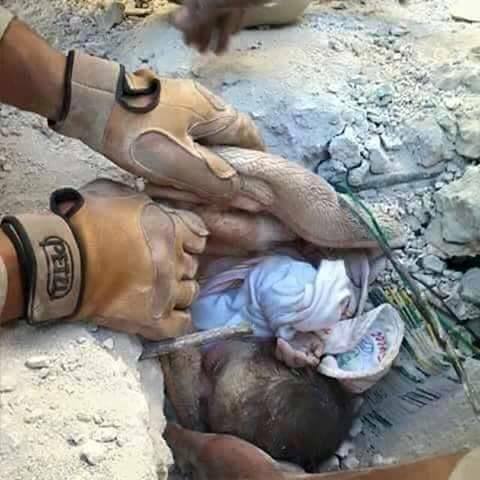 September 21, 2015 in Yemen. ← Update from Aleppo: “Moderate” rebels on a killing spree across Syria. I despair at what’s been transpiring in Yemen, with most of the mainstream media remaining quiet about it. I’m all the more embarassed by the extent to which the Saudis are using destructive weapons bought from us, the British. Indeed, from sources on the ground it also appears that the US is having a “direct” role in the bombing. There is also increasing proof of some very dirty bomb use. Its a disgusting situation made all the more abhorrent, as you say, by the virtual media silence and as for the UN and EU withdrawl from investigation of the war crimes..speechless. We are living in an insane world.